I am very late to the party with my review of Amber Rouge. There are many lovely takes on Maria McElroy’s newest perfume out there already. But I needed time for this one. There have been perfumes in Maria’s line I fell for upon first sniff – Geisha Noire is one fierce and wonderfully dark, sensual amber that I desperately want a full bottle of (it’ll happen this year) or Geisha Rouge, a spicy hot affair that doesn’t leave anyone cold. It is on this latter perfume, that Amber Rouge is based. A flanker or spin-off of sorts, Amber Rouge is a darker, sweeter development of the very spicy, but still airy and playful Rouge. 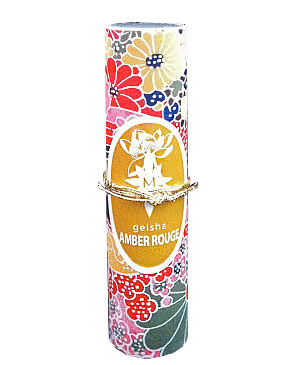 Geisha Amber Rouge includes notes of amber, cinnamon, clove, star anise, resins and incense and was created in 2011. So why did it take me so long to “get” Amber Rouge? And so, for the first few times I wore Amber Rouge, the honey (not listed, but definitely there to my nose) took over. It was a very cold day, when I got out Amber Rouge once more and gingerly, almost warily applied it to my wrist. And lo and behold – that day I smelled the whole picture. All of a sudden spices were there, hot cinnamon, cool anise, a rich clove. A deep, dark vista of resinous warmth opened before my nose, where previously there was only treacly sweet honey. It is still there, make no mistake, but now the honey chooses to play along with the others without overshadowing them all. As Amber Rouge develops a smoky facet steals in, further diminishing the sweetness and lending a more airy feel to the dense notes. And thankfully, once smelled in its entirety, I can’t un-smell Amber Rouge. It is a honey monster no longer. As always with Aroma M perfumes, I adore the fact that it is an oil. It feels decadent and caring to apply it and it is a great respite for my dry winter skin not to be drenched in alcohol for once. I’m glad I didn’t give up the fight against the honey too early, once honey moved over, Amber Rouge’s beauty was unveiled. This entry was posted in Amber, Aroma M, Fragrance Reviews, Gourmand, Honey, Incense, Spicy, Woods and tagged Amber, Aroma M, Fragrance, Honey, Maria McElroy, Perfume, Perfume Oil, Review. Bookmark the permalink. I love your blog!!!!! Now I need someone to fund my new wantings!!!!!!!! I definitely want to try Geisha Noire, as well as this one. I too love ambers and orientals. I also love oil based perfumes. My dad was in the airforce, and he used to go over seas a lot. He would often bring us back perfume oils. I loved them so much. They were three to five ml, and the cute bottles, were stored in even cuter velvet boxes. I remember that I had a favorite. I cant remember what the name was, and I had no awareness of notes, at the time. I lost it one night, due to college partying and stupidity, and to this day I miss it. It is interesting as I read your blog, and a few others, how I am tapping into certain memories, and looking at things lately. It is hard to explain, but my art work is taking on a new dimension as well. This goes to show, just how powerful scent can be, and how necessary it is. And I love your comments! It is so nice “watching” someone discover Perfumeland. You have managed to sell me on the Aroma M line – I want to try them all, although honey is not a note I have really explored. Are they available anywhere in the EU? Having said that I find myself in the middle of a PG obsession (you may be partly to blame, but also the freezing weather), I have always been content with a small decant of Cadjmere and suddenly I find myself using it, and my Felanilla and Aomassai samples, with wild abandonment. I may need to slow down my sampling! Aroma M is available at suendhaft.com. I’m glad you want to explore the line! PG is addictive, isn’t he? 😉 You remind me that I really miss Aomassai, sigh. This really does sound like a line worth exploring. Botrytis taught me not to discount honey as a note and I’m very grateful for that. I too love oils in all forms for hair, body etc. You’re right, they do feel very caring to apply. There’s something self-soothing about it. Honey is hard to get right, I think. Botrytis is a love and so is this one. I feel like I say this a lot, but this is another line that I haven’t really paid much attention to, but reading this review I can’t help but feel that I’m missing out on something. The spices in this one sound great, I’m a sucker for cinnamon and clove and I like the idea of these notes being paired with honey. I know :S It’s the same with DSH, Afterlier and many more! Honey is a favorite note, yet there aren’t many perfumes featuring the note in my cabinet; I need a sample set, stat! Like Tommy, I haven’t explored this line (or more accurately, paid attention to), but the reviews over the last few months can’t be ignored. You’ve made Amber Rouge sound beautiful! Thank you, Dee! Do you have a favorite honey scent? Thank you, Carrie! I love that about oils as well, longwearing, but low sillage.